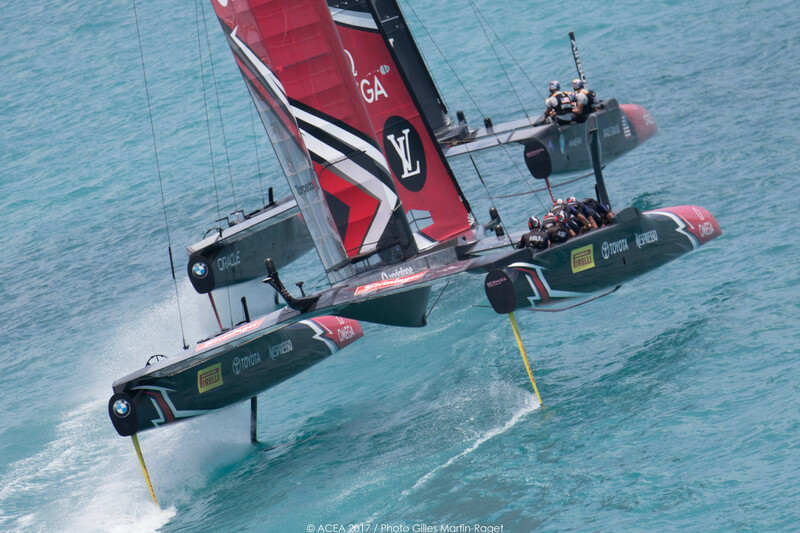 Another dominant race win today for Peter Burling and Emirates Team New Zealand in race nine of the America’s Cup Match, presented by Louis Vuitton, gave the Kiwi team victory on the Great Sound in Bermuda. Burling now adds the 35th America’s Cup to the Red Bull Youth America’s Cup trophy he won in San Francisco, 2013. The Kiwi team dominated the final stage of the 35th America’s Cup, winning eight races to ORACLE TEAM USA’s one race win, giving the New Zealanders a final winning score line of 7-1. The America’s Cup was last won by a team representing New Zealand in 2000 and they are now the Defenders of the America’s Cup for the 36th instalment of the competition for the oldest trophy in international sport. We’re just blown away,” said Peter Burling, helmsman, Emirates Team New Zealand. “We came here to win the America’s Cup and right now we’re taking the America’s Cup back home to New Zealand. “To be able to win eight races in beautiful Bermuda in front of a big crowd of our own fans is overwhelming, we’re just happy to be able to share this moment with them, we’re just blown away. “I’ve grown up watching this competition as a fan and to be a Kiwi and taking this Cup home is a dream come true. “We’ve had to go through some incredibly tough times to get to this point. It has been an incredibly tough path to get past the rest of the challengers and then ORACLE TEAM USA and it is credit to every team that competed. Glenn Ashby, Skipper, Emirates Team New Zealand, and the only sailing member who was part of the team’s 2013 defeat, was pleased to get the job done this time. “It has been an incredibly tough journey to get here,” notes Ashby. “We came across late to Bermuda from New Zealand and to be able to get the boat into good shape in such short time is all credit to our amazing team. Grant Dalton, CEO, Emirates Team New Zealand, was equally pleased to have completed the task. “We’ve done it, finally! “We probably don’t realise how big a deal this is back in New Zealand,” reported Dalton. “I’ve been told that there was traffic jams at 4am with people trying to get to work just to see the races, which is utterly incredible. “At the core of what we believe, we have to create an event that takes a lot of the good that has happened here, because there been a lot of good here. Just because we didn’t sign the Framework Agreement, that doesn’t mean to say there weren’t elements we didn’t agree with, it was just we didn’t agree with every element. Jimmy Spithill, Skipper, ORACLE TEAM USA, was humble in defeat. “On behalf of the whole of ORACLE TEAM USA – congratulations to Emirates Team New Zealand,” said Spithill. “What an incredible team. They’ve been a class above everyone in the 35th America’s Cup and we take our hats off to you. Well done. As to the future of the team, Spithill had not spoken to team owner Larry Ellison on the topic. Sir Russell Coutts, CEO, America’s Cup Event Authority, was quick to acknowledge the first New Zealand victory in the America’s Cup since 2000, saying, “I would like to offer my heartfelt congratulations and praise to everyone in Emirates Team New Zealand for winning the 35th America’s Cup. “Helmed brilliantly by Peter Burling, with the guiding influence of skipper Glenn Ashby, supported by a world-class sailing, design and shore team, they performed magnificently here in Bermuda – winning in dominant fashion. Emirates Team New Zealand and ORACLE TEAM USA enjoying clean starts, but the defender to windward accelerated better off the line to lead at mark one. However, with the defender sporting bigger daggerfoils than yesterday, anticipating less wind than there actually was, the impact was immediately seen on the next leg. With the superior kiwi downwind speed, the challenger rolled the defender after the first gybe and leading at the second mark. Burling was serene at the helm of the Kiwi boat, displaying no nerves as he steered his team towards glory, but Spithill and the ORACLE TEAM USA crew were not giving up, constantly splitting to gain leverage, but the Kiwi team never gave them an opening from which to benefit. After the upwind let, the Challenger’s lead was up to 26 seconds at the third mark, increasing further downwind to 34 seconds at the fourth mark, and from that point, barring mistakes by Burling and his all-conquering Emirates Team New Zealand crew, the die was cast. Emirates Team New Zealand never allowed the lead to get too big, at times spending some to stay in the same winds as ORACLE TEAM USA, thus minimizing the random winds on the Great Sound. New Zealand sealed their win in impressive style, crossing the finish line for the final time in the 35th America’s Cup 55 seconds ahead of the US team. Race Nine: Emirates Team New Zealand beat ORACLE TEAM USA by 55 seconds. * Scoreboard: While the Challenger won eight of the nine races, their match score was 7-1 because the Defender, which won the Qualifiers held on May 26-June 3, began the series with a one point advantage. As the rules detail, the Challenger would carry a one point disadvantage (ie, minus 1), meaning they needed to win eight races to take the trophy whereas the Defender need only win seven races.